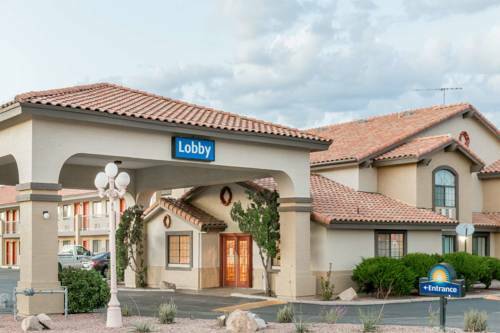 The Days Inn Willcox is located in Southern Arizona off Interstate Highway 10 at exit 340. We offer a free hot breakfast which consists of eggs, sausage and waffles, free high speed internet, inroom coffeemaker and free local phone calls. We feature rooms with Queen and King size beds with refrigerators and microwaves. There are several restaurants and shopping within walking distance to our hotel. While visiting Willcox enjoy the local attractions such as, Rex Allen Cowboy Museum, Cochise Visitors Center, Chiricahua National Monument, and Kartchner Caverns. Join Wyndham Rewards our customer loyalty program and start enjoying even more rewards. We look forward to seeing you soon in Willcox, Arizona. While the human performers are still home sleeping, animated mannequins provide a "living dead" reenactment of the famous gun battle. Officially named the Shrine of Our Lady of the Sierras. Built not by the Catholic Church, but by upstate couple Gerald and Patricia Chouinard in the late 1980s.